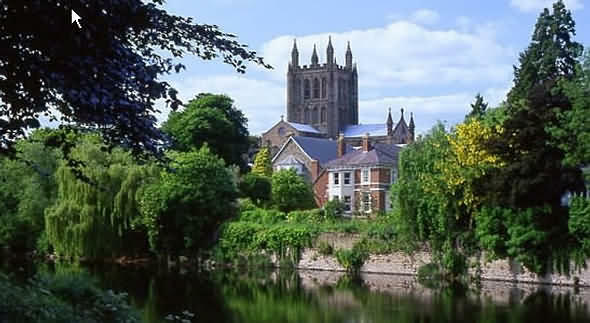 Hereford is a beautiful cathedral city; it is very well preserved with some of its buildings dating from the seventh century. Hereford lies close to the Welsh border and therefore has played a vital role in both English and Welsh history throughout the years. It is a city of great antiquity - its magnificent Cathedral dates from 1079 and is therefore one of the oldest in Britain. The city has the highest concentration of almshouses in the country and some fine examples of medieval stone carving are found in local churches. Hereford is the home of one of the largest cider makers in the world while it is also represented in many countries by the Hereford breed of cattle. The magnificent Hereford Cathedral towers over the town. Take a moment to have a look at the stonemasons' work - the skill of these craftsmen is very evident. After exploring the cathedral make sure that you visit the Mappa Mundi, a thirteenth century map which shows Jerusalem as the centre of the world. Christopher de Hamel, a leading authority on medieval manuscripts said "... it is without parallel the most important and most celebrated medieval map in any form ..." . The Chained Library is also worth a visit; this is a collection of rare manuscripts and religious relics, treasures really, housed in the New Library Building adjacent to the Cathedral. Even though Hereford is a medieval town, it has progressed with the ages, adapting its traditional buildings to accommodate both residents and visitors alike. While here you can stay at anything from the most modern to the most antiquated buildings. Restaurants are plentiful with a wide range of cuisines. This really is a lovely place to stay while visiting the Marches and surrounding districts.